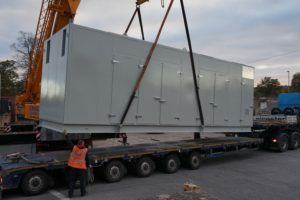 We recently completed the design and manufacture of an acoustically insulated container for a new CHP (Combined Heat and Power) system being installed at Gloucester Royal Infirmary. The bespoke container, 10m long x 3.5m high x 3.2m wide, was designed to reduce noise to 65dBA at 1m and incorporated a fully-insulated base and a separate control room built at one end of the enclosure. Included in our scope of supply was the installation of a 22 ton engine at our premises for final fit out on site. The design of the container incorporated a structural assessment to allow lifting of the container complete with 22 ton engine inside. To support ongoing maintenance the container was designed with a removable roof section and roof mounted ventilation attenuators with weather cowls. For more information visit our products pages or read our latest case studies.